The tasks of parents are endless and overwhelming and it’s understandable that you would welcome help wherever you could get it, including your child. And, well, you’ve managed to raise a very mature and responsible child, even one eager to be helpful and thriving in this role. This is wonderful and a credit to you as a parent. You may be tempted, based on this, to allow your child to play an active role in those numerous tasks of adulthood and parenthood. If your child is good at math, why wouldn’t you allow her to handle your finances, especially when she’s adept at using the computer and she is eager to help? Or, why wouldn’t you let your son help take care of his younger siblings and remind you of their needs, or monitor your drinking, since he’s offered, fits easily into these roles and seems to really care and be concerned? It’s a win-win, right? You get help and your child feels good about their contribution and a sense of competence and power. However, this is exactly the double edged sword. As a child therapist, I have seen that the more parents blur the lines between child responsibilities and parental responsibilities, the more parents lose their authority and the more kids are left to flounder; feeling they are without the protective safety net of parental oversight. After all, from their perspective, who’s in charge and who can they count on, if you are counting on them? In my experience, when pressed into service, kids will always rise to the challenge. They will do so because their survival impulses kick in, they love you and they want your approval. This is an all or nothing proposition, and I’ve seen kids be capable of amazing things when parents relinquished their roles. But don’t let this fool you. It doesn’t mean the child is capable, especially developmentally, and kids and the parent-child relationship pay an irreparable price for this trade off. What I have seen as a child therapist is that “parentified/adultified” kids are often depressed as kids and continue on to be depressed, sometimes suicidal, adults. They may feel robbed of their childhoods, and lost and angry over the lack of parental modeling and investment; after all if their parents couldn’t love them enough to step up to the plate and provide all the requisite parental care, who would. As a result there are often questions for them about their worthiness and the role they have to others and others to them. Just remember that our earliest significant relationships form how we see ourselves, ourselves in relationship to others and in the world and shape all our future relationships. What about if there are other children in the household? 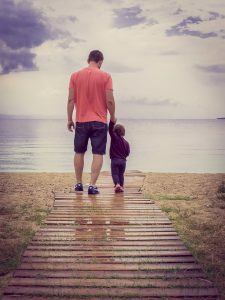 Parents lose authority when they share responsibility with their kids, which may work just fine with this responsible child, but will cost them in their relationship to any other children in the household who are likely to see this as weakness. This creates a dynamic of the “good child” and leaving the other child(ren) to be the bad ones, since the role of good, parent aligned child is already taken. Seeing their parents as having delegated their parental authority out to a sibling who has settled into this exclusive role, it leaves them to perceive themselves as alone with no one really in charge or willing to be (and let’s face it, they are not going to listen to a peer, be it a sibling or parents they perceive as peers). So, what do you do and where do you draw the line? As a child therapist, I suggest to parents that they always let their kids know that their skills and competence are valued and valuable, but that adult/parent responsibilities are always that, no matter how mature the child is. You reinforce that they are allowed and expected to be kids (which in these times, is stressful enough). You also model responsibility and competence to your child, so they know that though you are not perfect, they can count on you to be the parent. In my experience in my role as a family and child therapist, this can instill a sense of security and safety. Whether kids acknowledge it or not, they need you in this role. This is not to say that it is not part of the parenting role to assist children in developing responsibility and skills. It is a vital part of parenting. However, the appropriate arena for this involves the tasks associated with the “child’s world” and child themselves. These tasks should always be primarily motivated by an attempt to teach, rather than those that are related to your needs as a parent. For example, you help teach them to take responsibility for their homework, waking up on time for school, grades, their friendships/relationships, their behavior at home, school and other environments in which they interact, their finances and employment. There are many more examples, but do you see a pattern? It is incumbent on parents to allow kids to gradually learn to be responsible for their worlds and leave the parents world to the parents. This also means that the child’s world is theirs, not the parents, and as such is the child’s to navigate, especially as they grow through adolescence. [However, this is a topic for another article]. Suffice it to say, children should not be pulled into adult/parent roles/world and parents should not insert themselves into the child’s world/roles. I know this is not easy because you care, but because you care, this is why it is essential. As a child therapist that offers family counseling and parenting support as well, please don’t hesitate to contact us to schedule an appointment to get support and guidance. You deserve to feel good as a parent and we’re here to help! Michelle Topal, MSW, LCSW is a licensed clinical social worker offering family counseling, child therapy & parenting support, including help for co-parenting exs , as well as couples therapy for over 30 years.